Welcome to the newest issue of What to Wear This Month! This month, you’re getting fifteen warm and layered January outfit ideas. To see past month’s outfit ideas, visit the What to Wear This Month page. You’ll find ideas that’ll work for your fall and winter wardrobe needs. For January’s outfits, I focused mainly on layering because that’s the best way to stay warm. Plus, if you layer right, it makes for one great outfit. This month I didn’t create any outfits with skirts/dresses. Why? Because I don’t know about you, but my legs don’t see the light of day until around March. Yes, you can wear tights with your skirts and under your dresses, but I thought it would be more helpful to share some stylish ways to layer. I’ve categorized January’s outfits according to pants color: black, dark denim, light denim, and white. I hope you enjoy these outfit ideas for winter and find them useful! This is an outfit from the 5 Camel Coats Outfits post. I bought the coat pictured here a few weeks ago and I am so happy with it. It’s been the perfect layering piece for my more dressy outfits. A fitted turtleneck sweater under your winter coat will keep you nice and toasty warm. For another layering piece for added warmth, add a fitted long sleeve t-shirt under the sweater. 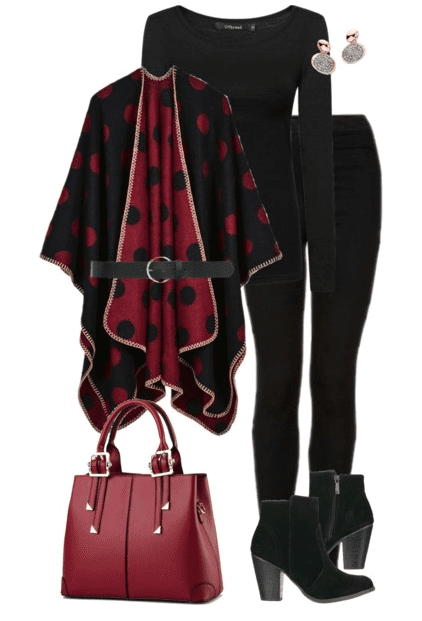 I love a stylish poncho! Belt it for a fun look and to give your waist some definition. This outfit is so cozy. You can’t beat a cozy cardigan and fluffy boots on a cold day. For added warmth, add a button up shirt over the long sleeve t-shirt. When you find a striped black and white t-shirt you love, it can become a staple in your wardrobe. There is so much you can do with it! Like wearing it under a cute sweater where the stripes peek out from the sleeves and at the hemline. This coat has been super popular for the last couple of years and I don’t see it slowing down anytime soon. If you’re tired of the plain jane coats, step up your winter outfits with this plaid coat. 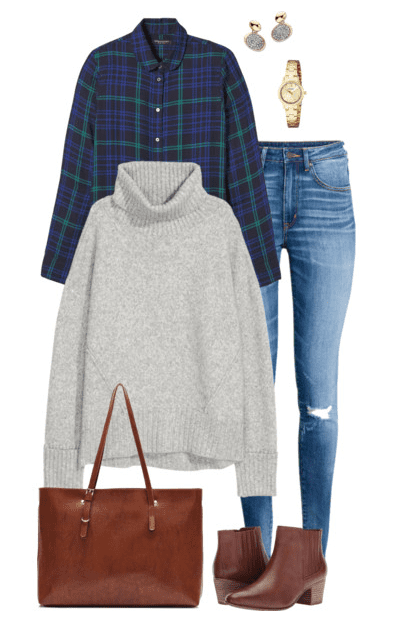 This is such a basic outfit, but one you can build on and layer if the weather gets colder. But you can’t beat a classic look with a black and white striped shirt and a camel coat! 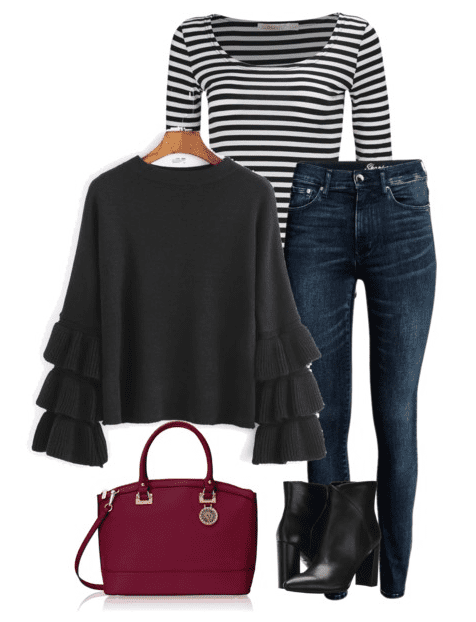 I saw this sweatshirt and instantly knew I wanted to include it in January’s outfit ideas. Between the color, the embroidered flowers, and the sleeve design, all you need is to pair it up with jeans and cute boots and you’re good to go! To me, January is for breaking out the Fair Isle Sweaters, wearing beanies and staying inside as much as humanly possible curled up with a cup of tea. This sweater from H&M is affordable and comes in three different designs. A classic denim shirt like this one from J. Crew will serve your wardrobe needs very well. Wear it under a sweater like pictured above, or over your sweater with the buttons undone. There are limitless style possibilities with a shirt like this, which is why making an investment in a higher quality one is worth it. It’ll last you years and years to come. Try pairing a button up shirt with a turtleneck for a very warm, layered look. One style trick: if the button up shirt under your sweater tends to bunch up and make you look frumpy, wear a form fitting cami over the button up shirt to smooth it down. No frump, no button lines showing and it gives your outfit a nice smooth look. Plus, no one will know. This is a great way to layer if you’ll be out and about in snowy weather, but don’t want to wear a large coat. Try pairing a black embellished sweater with white denim for work or an occasion when you want to dress up a bit. Add some heels and you have the perfect classic black and white outfit. This outfit is a feature I did last year about winter white outfits. While some may find an all-white outfit slightly impractical, I’ve found others love the look. A classic camel coat with white jeans and leopard print heels is one very fun look. For February, I’ll be creating some Valentine’s Day looks. Let me know what else you would like to see!